Notes about Ken Anderson added, July-August, 2017. That's right, a boat ride. 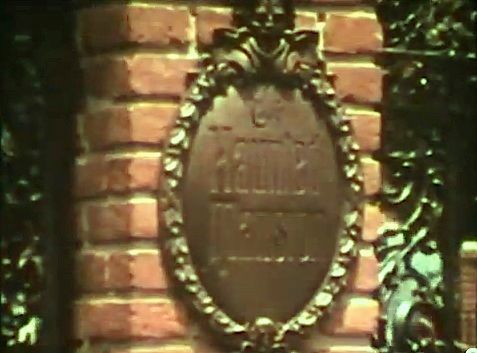 It's only a footnote in most reviews of the Mansion's historical development, but for a short period the Imagineers toyed with the idea of making the Haunted Mansion a water attraction. 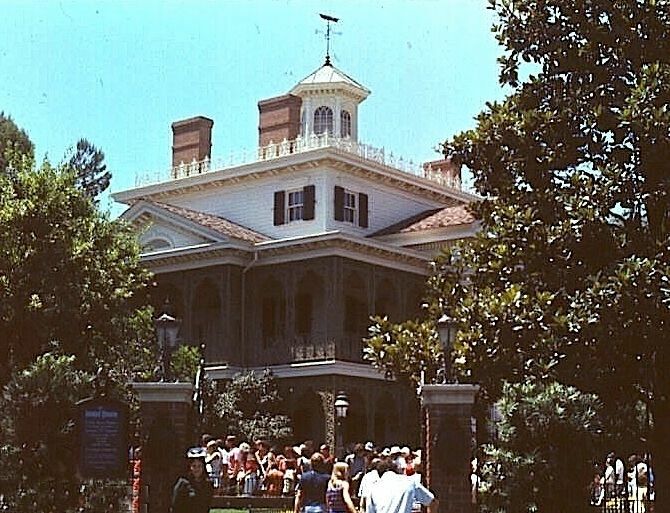 This was back when (1) they knew that the Mansion needed some sort of conveyance for the guests but (2) before the Omnimover system came along in 1967 and solved the problem. By the way, the problem was not ride capacity per se. 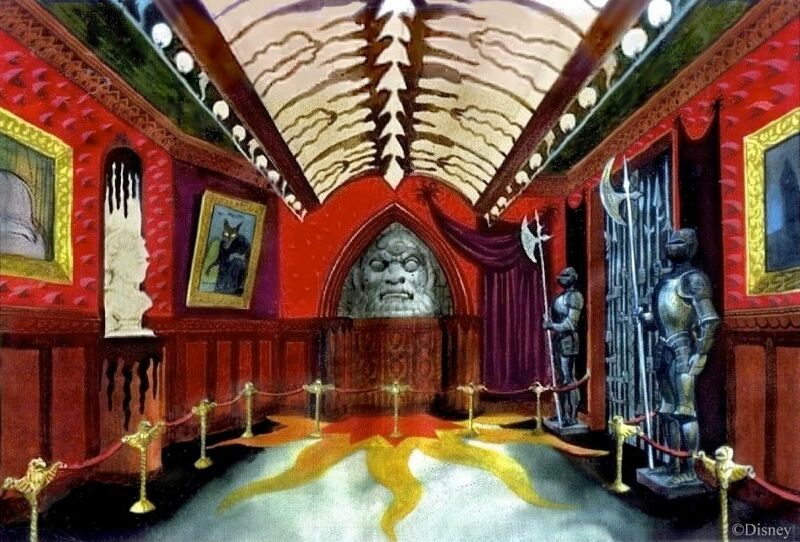 By deciding to build two identical walk-thru attractions side by side, the guests-per-hour numbers seemed manageable. (You will recall that this is why they built two stretching galleries in the first place. Each would lead to a different walk-thru.) No, the problem was crowd control. Could you keep these packs of 50 or 60 people moving efficiently, or would there be backups if, say, one frightened child held up the proceedings? And could you prevent vandalism well enough with such a system? Those were the sorts of problems that had them searching for some way to make it a ride ride. 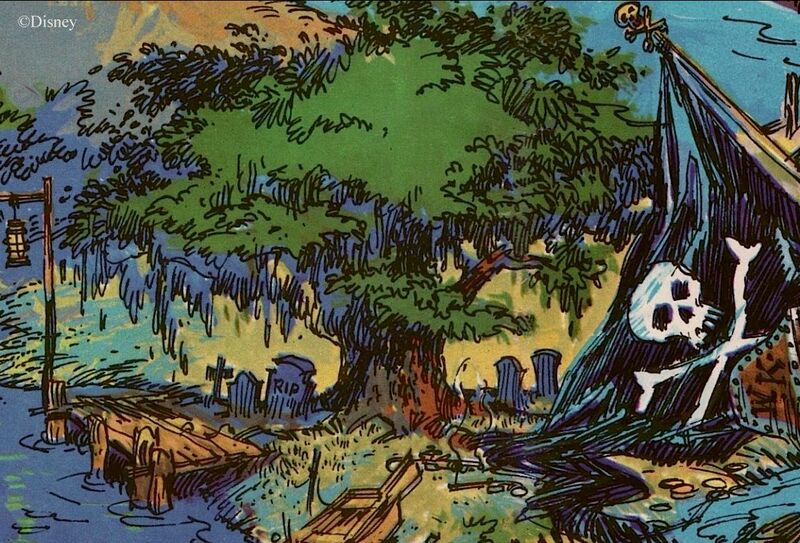 For me, the idea of making the Haunted Mansion a boat ride is the most intriguing conveyance possibility they ever seriously considered. The problem is that practically nothing has been published in the way of artwork, whereby we may satisfy our curiosity. But hey, since when has lack of evidence slowed us down? At Long-Forgotten we laugh at lack of evidence. Ha ha, laugh we. Anyway, it turns out there are clues to be found in various crooked fannies, and these clues will allow us to at least raise our guesswork to the level of informed speculation, even if a goal as modest as simple probability remains out of reach. So . . . prepare to make sail. 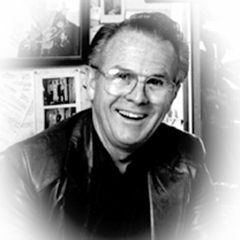 It was Fred Joerger who came up with the concept. 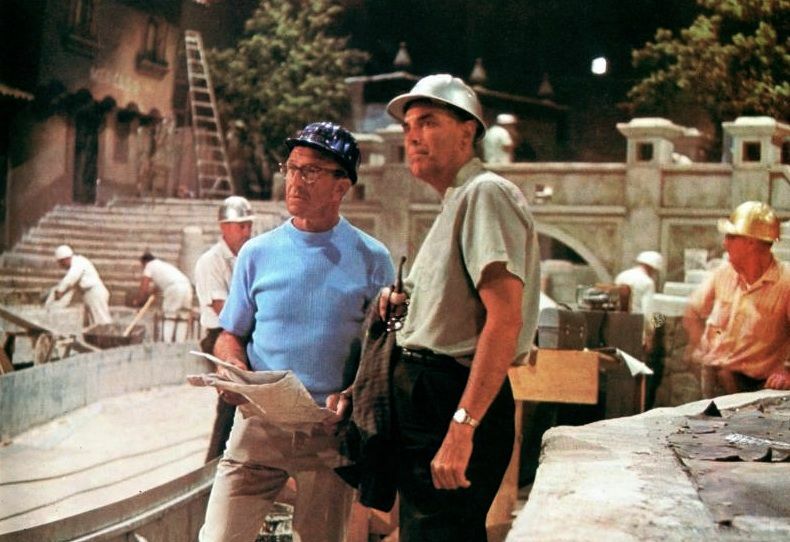 Fred was mainly a model maker for the Mansion, but he had experience as a set designer as well. As he tells it, he first brought the idea to Claude Coats. Why not put in an old bayou with about three feet of water and take guests through in boats? There would be complete crowd control, and there could be "keen illusions" involving things coming up out of the water, as well as reflection effects. There would be wallpaper peeling off the walls, and all that sort of thing. According to Joerger, Claude liked the idea and suggested they run it by Walt. Walt came by "just a little later," but when Claude told him about Fred's concept, the boss scuttled the idea immediately: "We've got too many boat rides already." Joerger always thought that was pretty ironic, considering that this was before they had built Small World or Pirates of the Caribbean (Didier Ghez, Walt's People: Volume 6 [Xlibris, 2008] 231). Other accounts suggest that the idea was alive for a longer period. 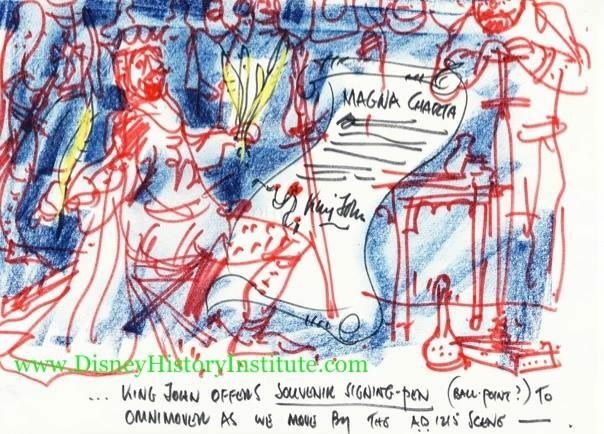 Either the Imagineers continued to develop it despite Walt's initially negative response (very possible), or Joerger has compressed the events in his memory into a shortened time frame. There were several different guys who reportedly worked on the project at one point or another. 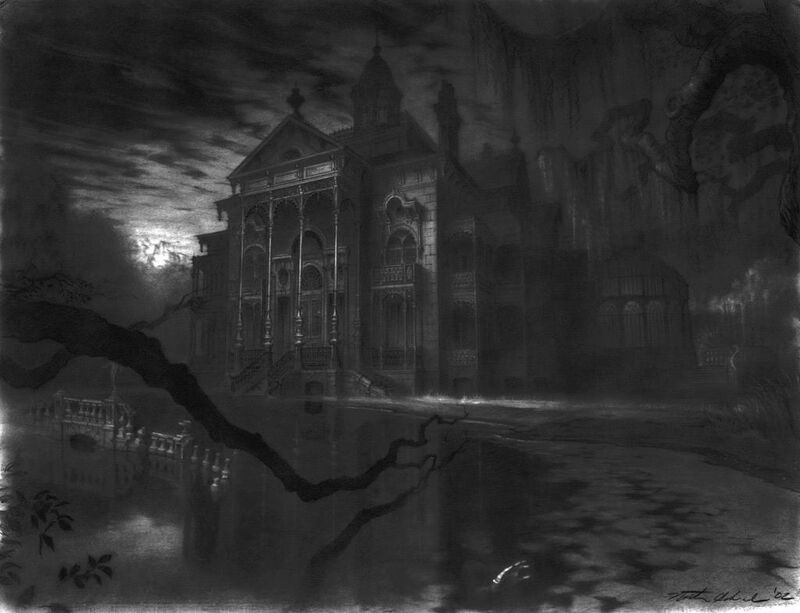 According to Imagineer Pat Burke, Sam McKim showed him some concept artwork he had done depicting boats floating through a flooded Haunted Mansion. 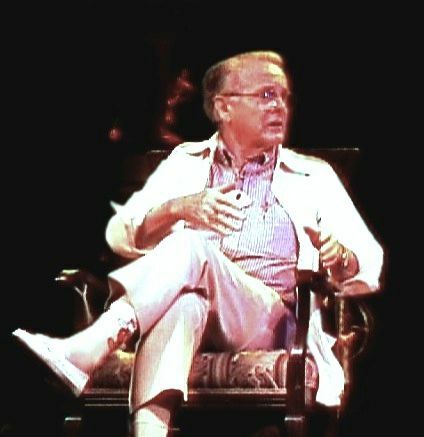 Burke thought it was "much like the Blue Bayou" in its themeing. 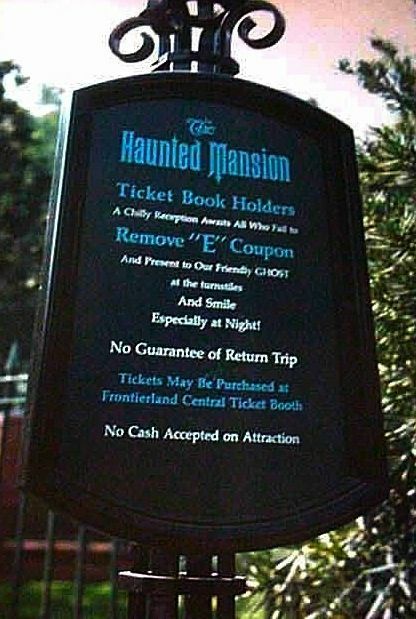 Marc Davis also makes passing reference to the boat idea (The "E" Ticket 16  22), and Yale Gracey reportedly did some work on it, no doubt cooking up special effects that would work in such a setting (Jason Surrell, The Haunted Mansion [NY: Disney Editions, 2009] 32). 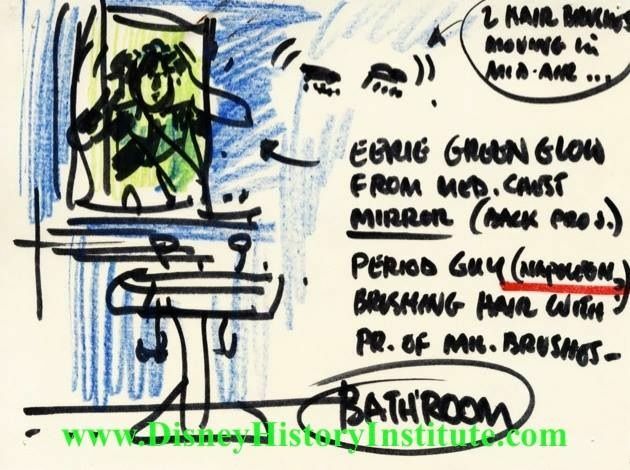 If Coats and Davis were involved, and Walt vetted it, we can probably assign a date of 1964 or 1965 for Fred's brainstorm. Judging by the number of Imagineers who worked on it, the idea must have remained afloat for a respectable length of time before it was finally abandoned. 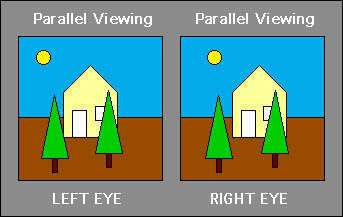 As we shall soon see, this could be useful information. bayou below the foundation of the house" (The "E" Ticket 13 [Summer 1992] 5; our emphasis). Elsewhere Anderson describes the scene in more detail. Once the guide was taken out of the way (by a hairy arm), the "haunted house ghost" would express his delight with now being in charge of the tour, telling the guests, "I'm going to take you down and show you the way it really is. We'll go into the place where it is just a bayou." 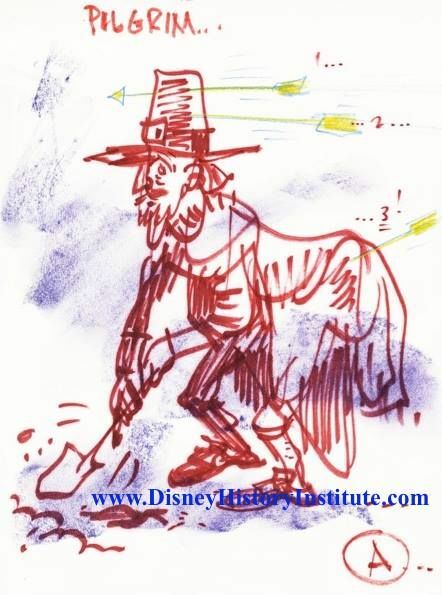 The guests would sink down on the conveyance device Anderson had devised, and there would be muddy water all around, although there would be no boat ride (Paul Anderson, Jack of All Trades: Conversations with Disney Legend Ken Anderson [Theme Park Press, 2017] 217; our emphasis). 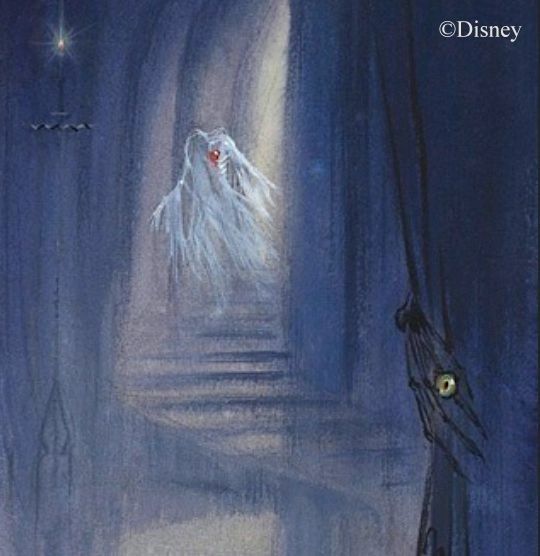 nightmarish interior decoration was still the presumed approach, even by Marc Davis, as we have seen (and seen and seen). for a walk-thru. Are we riding in a boat? Is that a watery reflection of the staircase on the far right? and there isn't much choice. I won't bother explaining why it's incomplete. Be happy we've got 80% of it, okay? paintings may be the only artwork currently available that reflects Joeger's idea. 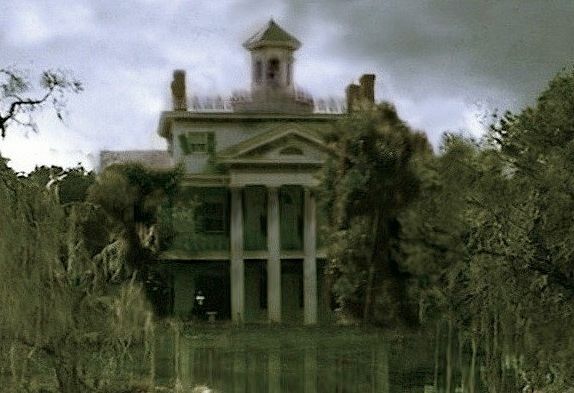 A partially flooded Mansion was realized at least once—on film. 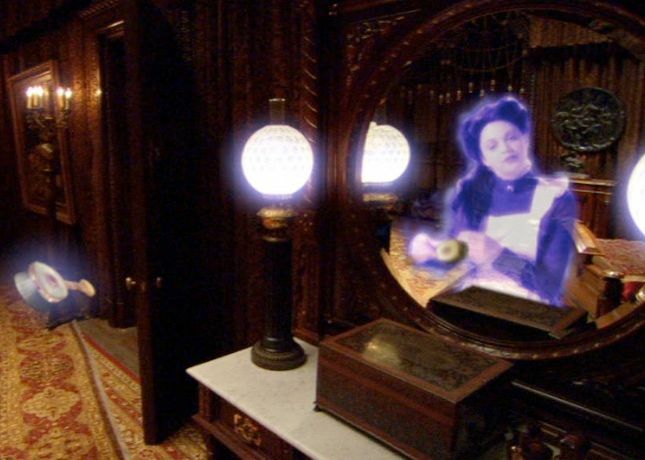 The 2003 Haunted Mansion movie makes use of a concept similar to Joerger's. 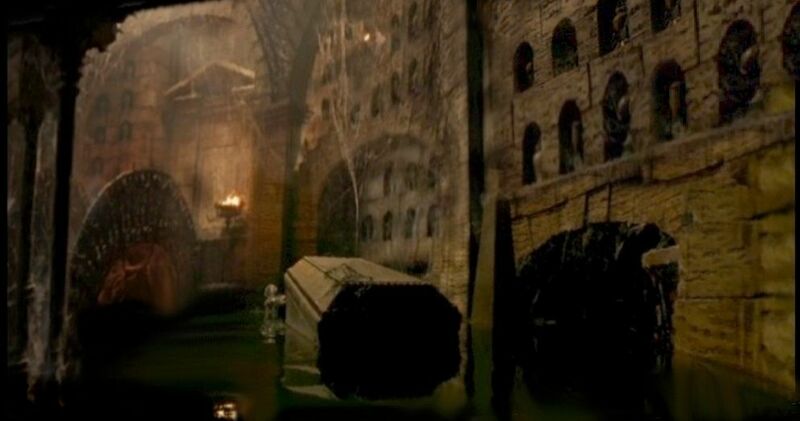 After a heavy rain, a huge underground crypt is flooded and serves as the locale for a major scene in the film. 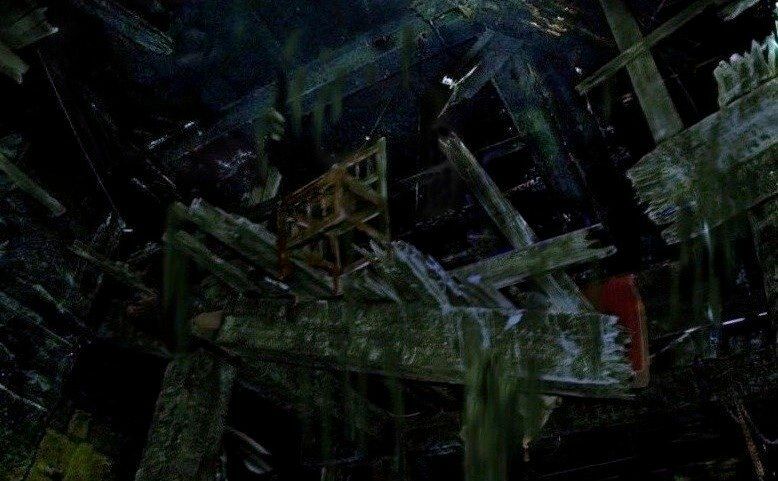 Presumably, the basement levels of the house itself would also be flooded, although you never see this in the movie. (see below). For what it's worth, compare this with the blue Redmond painting above. Is that all, then? What have we got? 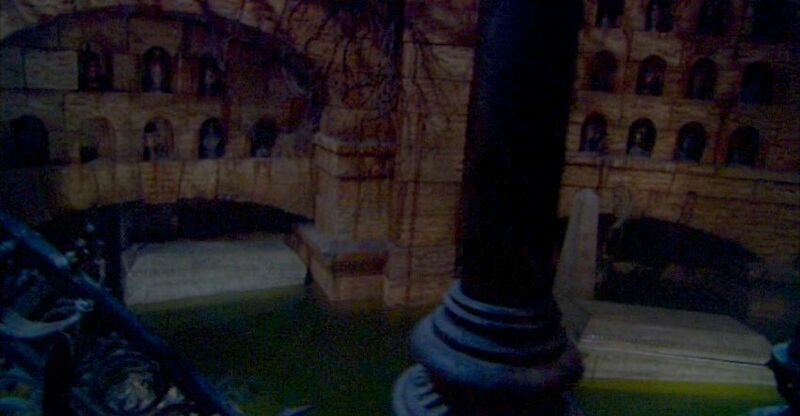 (1) a few quick descriptions, (2) a couple of ambiguous watercolors, and (3) a flooded crypt in the 2003 movie. 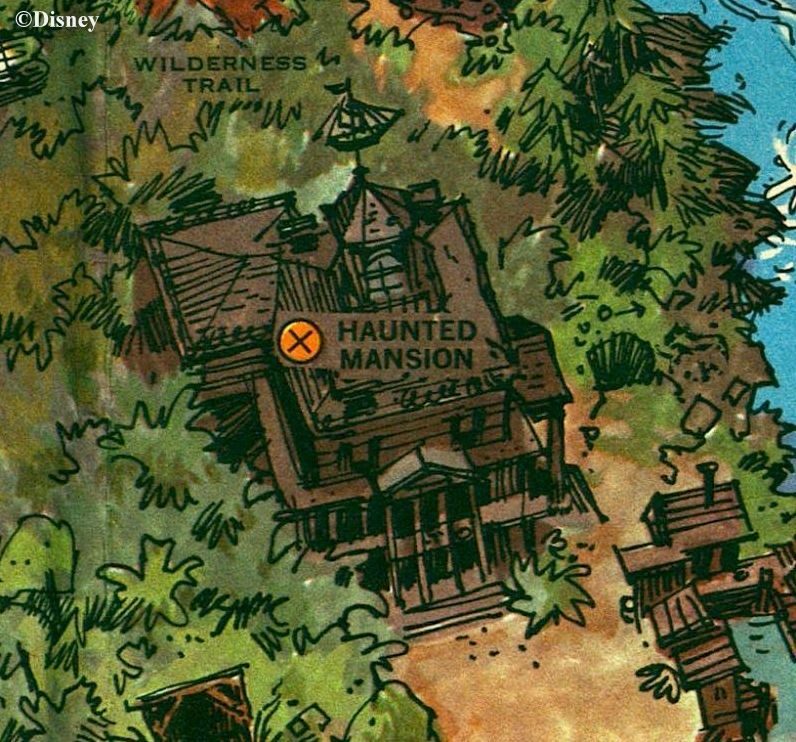 Beyond these fragments shored against the ruins, is there some way by which we may get our heads back into this boat ride version of the Haunted Mansion? Aye, me hardies, that thar be. That's . . . bad. Anyway, we've assigned Fred's light bulb moment to about 1964 or 1965 and concluded that it was probably a live option for some time. So what? 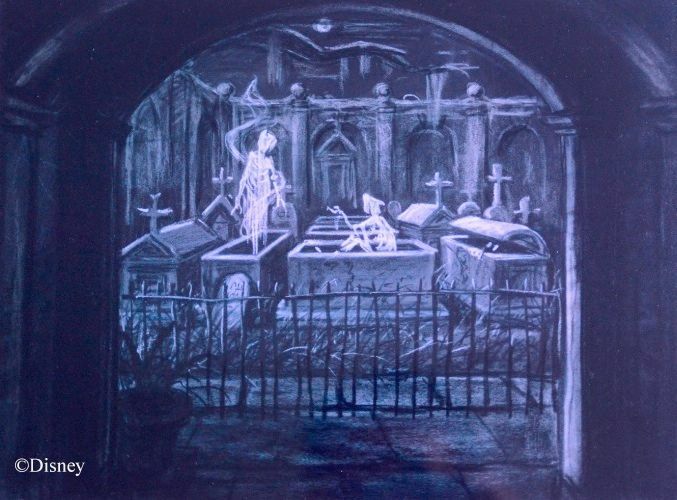 Here's what: It means that the Haunted Mansion boat ride idea was born, lived, and died during the same time period that the Imagineers were hard at work on Pirates of the Caribbean. 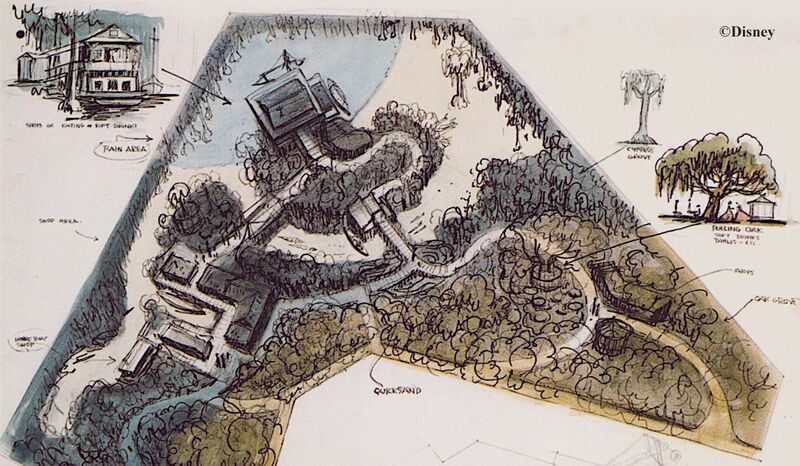 Walt had already decided by the end of 1963 that POTC would be a boat ride, with guests going down a waterfall and beyond the berm to a big show building. Coats and Davis and many others were knee deep in the POTC project in that format by 1965. 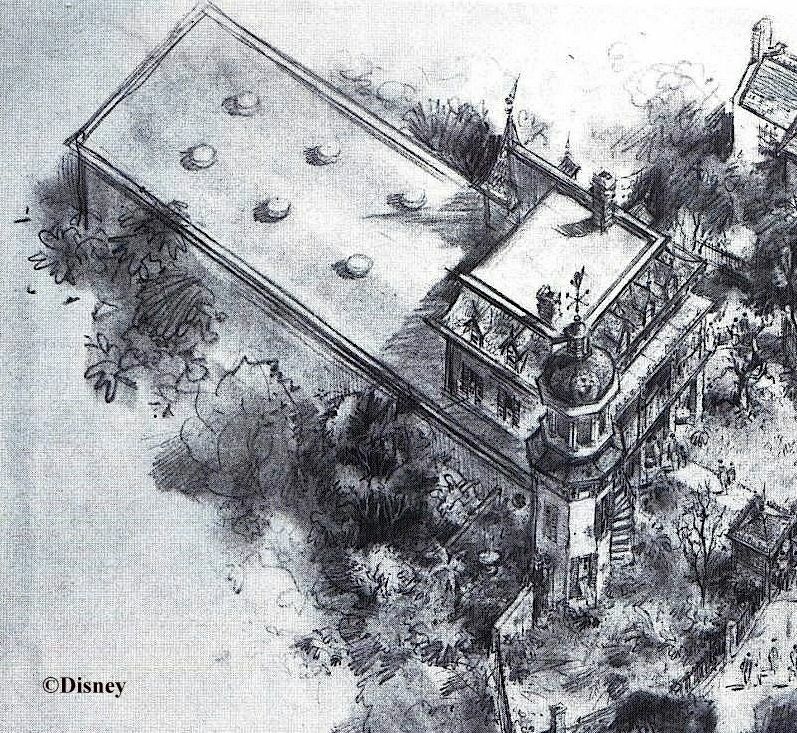 If that is the historical context for Fred's Mansion idea, we may reasonably ask if any vestiges of the abandoned concept were incorporated into POTC. I think it's possible. 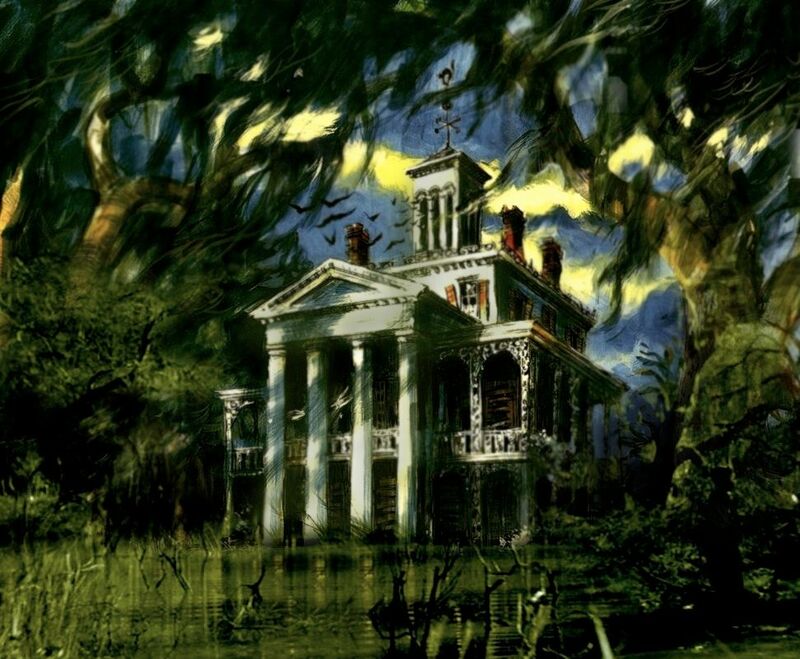 Note that one of the very few things we know about concept artwork for this version of the HM is that it reminded one viewer of the Blue Bayou. 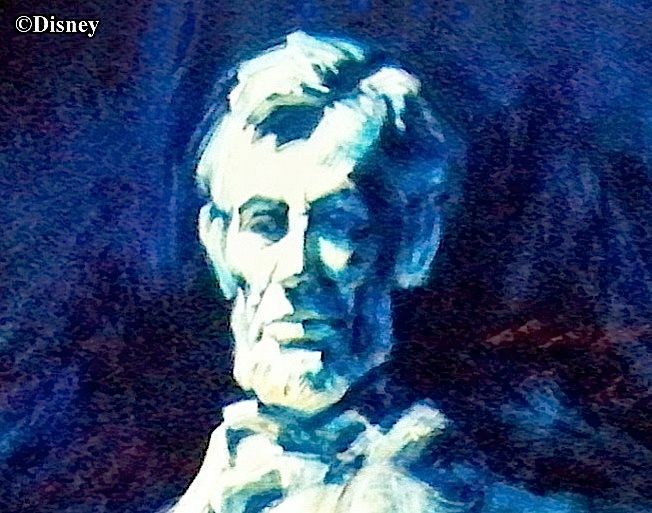 Well, that artwork was done before the Blue Bayou was built. 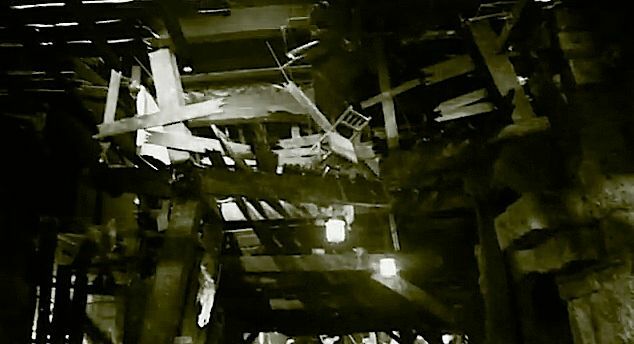 the passage below the burning town, between the jail scene and the arsenal scene. I note that Dave DeCaro, too, has fallen under the spell of The Chair. You Disneylander readers, you have too, haven't you? Did so long ago, didn't you? There's also a table up there with a shawl hanging off of it. 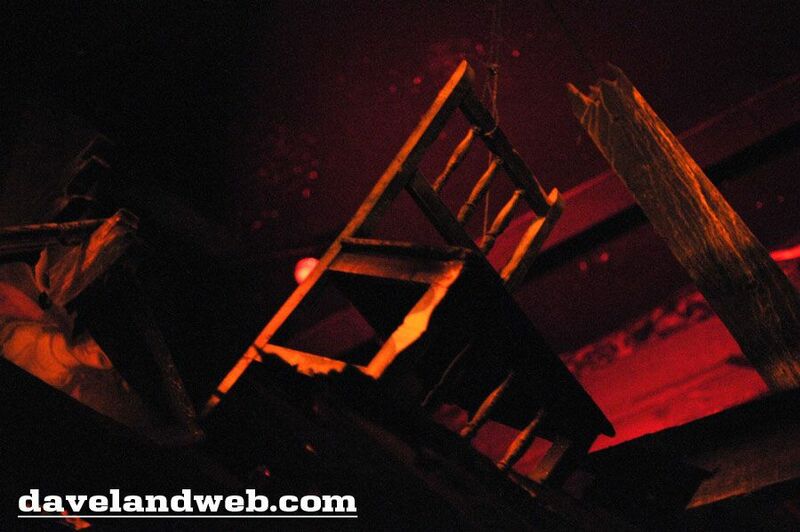 It too captures your attention for some reason, but nothing beats The Chair. Before he graduated to more sophisticated cameras and started producing these rich, atmospheric shots, Dave took some simpler flash pictures. 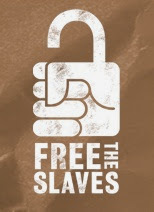 In a way, they're better suited to our purpose. 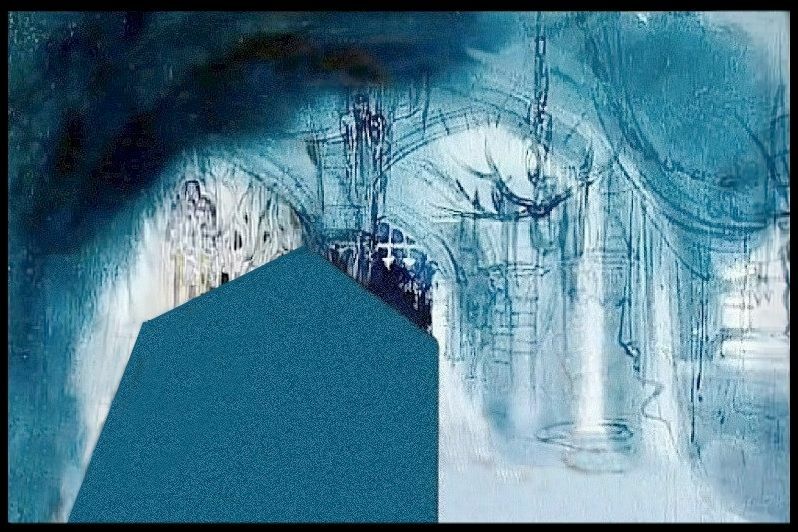 Okay, in the following photos imagine you are peering upward not into the half-charred beams of a burning town but into the decaying interior of an old house. 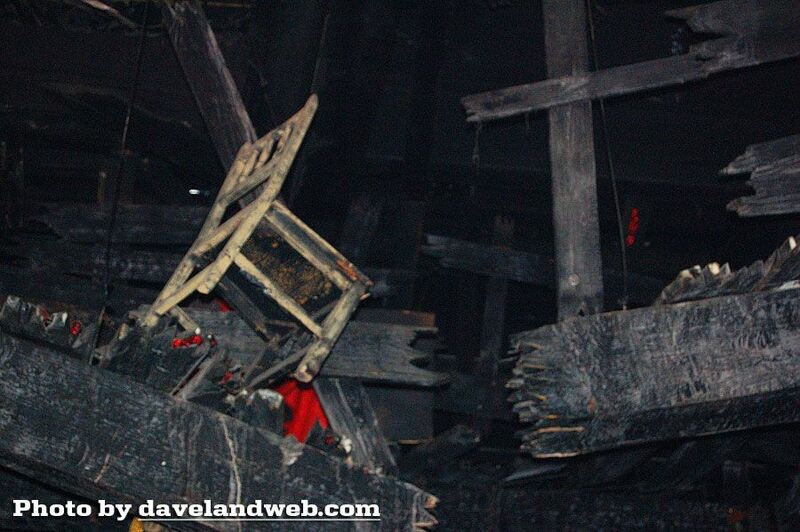 Floors have rotted through, and stuff has fallen. Stuff like chairs and tables. In these POTC pix, all you really need to do is replace the red embers in your imagination with Spanish moss or creeping vines, and perhaps put in some of Joerger's "peeling wallpaper." 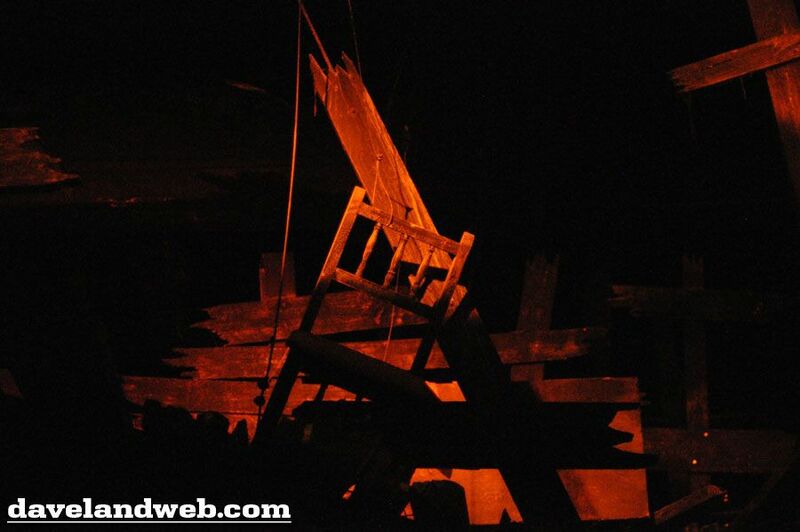 to tumble down through the rotting timbers onto the boats as they passed beneath. You know, this thing is starting to sound like fun. It isn't hard to imagine, is it? 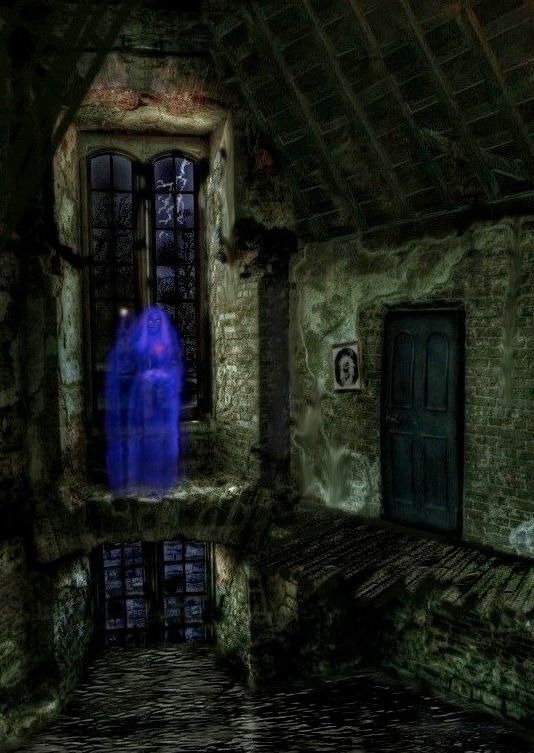 And I haven't even put any ghosts in there yet, visible in and through the decaying building, going up perhaps several stories. 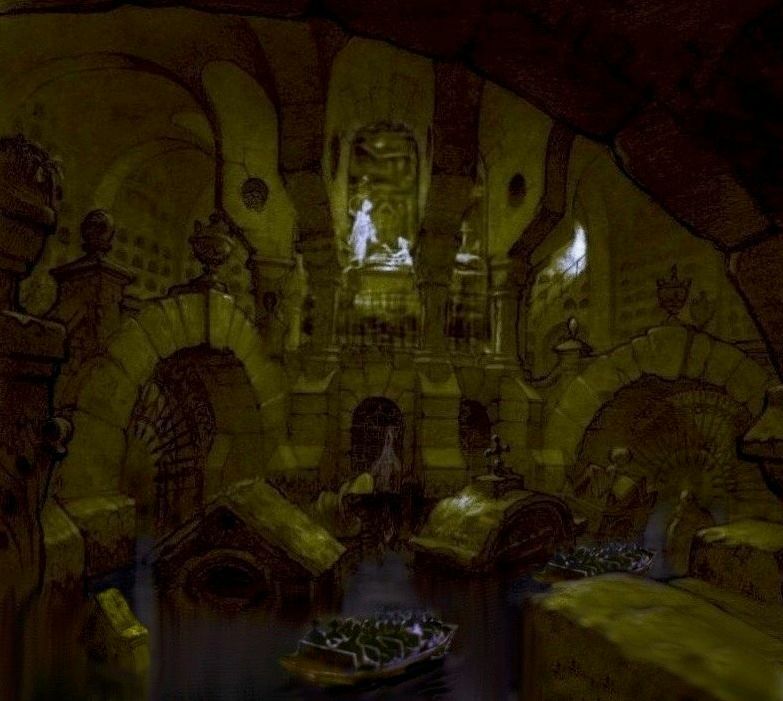 Any such or other concepts for a HM boat ride would have still been on the table when POTC scenes like this were designed. I don't think it's too much of a stretch to suppose that there may have been some imaginative transference. Passing below a rotting mansion becomes passing below a burning town. 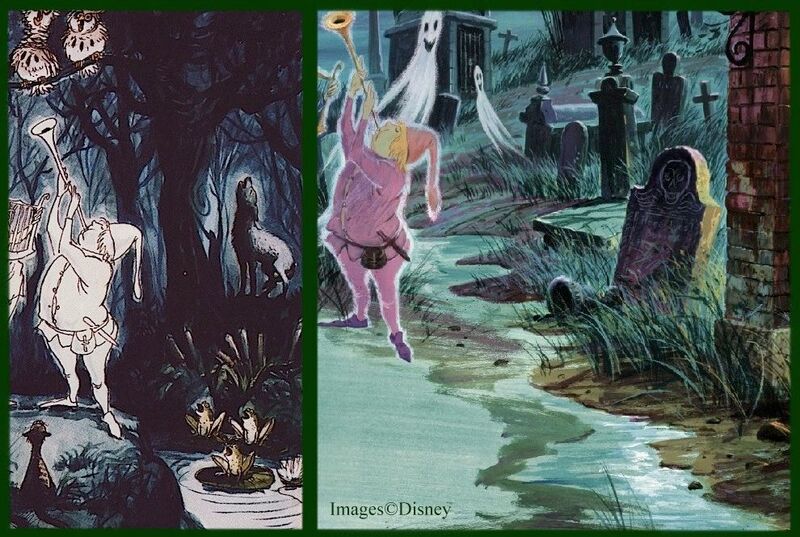 As we've already said more than once, someone who saw Sam McKim's concept art for the HM boat ride thought it had a "Blue Bayou" atmosphere. 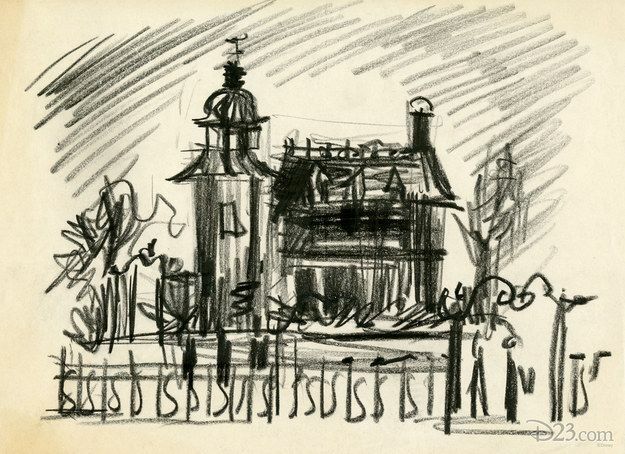 Well, McKim sketched the BB also. 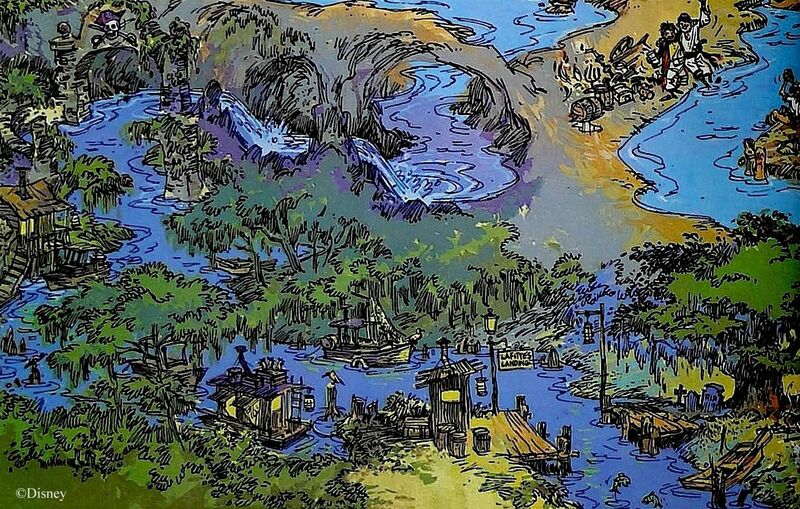 He produced a "fun map" of the POTC, and one wonders if there too one can find something that looks like a possible holdover from the flooded Mansion. 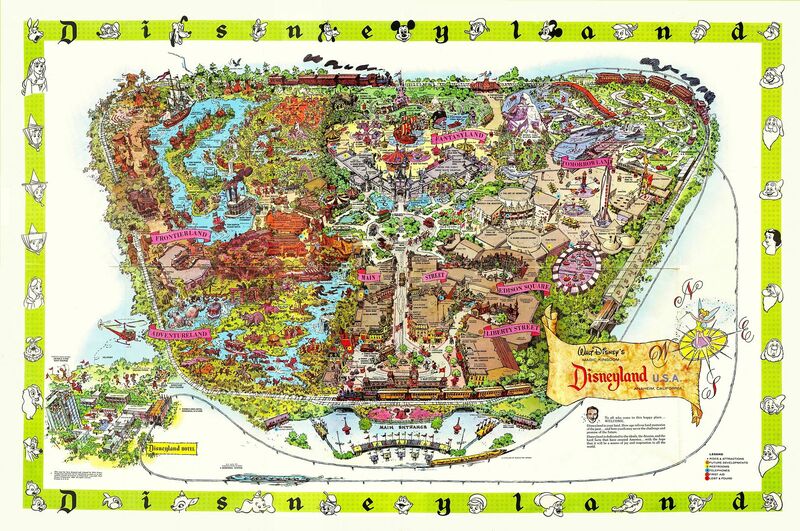 The Bayou section of McKim's sketch is an absolute delight, but does it include anything you don't see in the actual ride? The answer is yes, there is one thing on McKim's map that has no counterpart in the POTC ride: the dueling oak. It was an old New Orleans tradition for duelists to have it out under the spreading branches of certain oak trees. 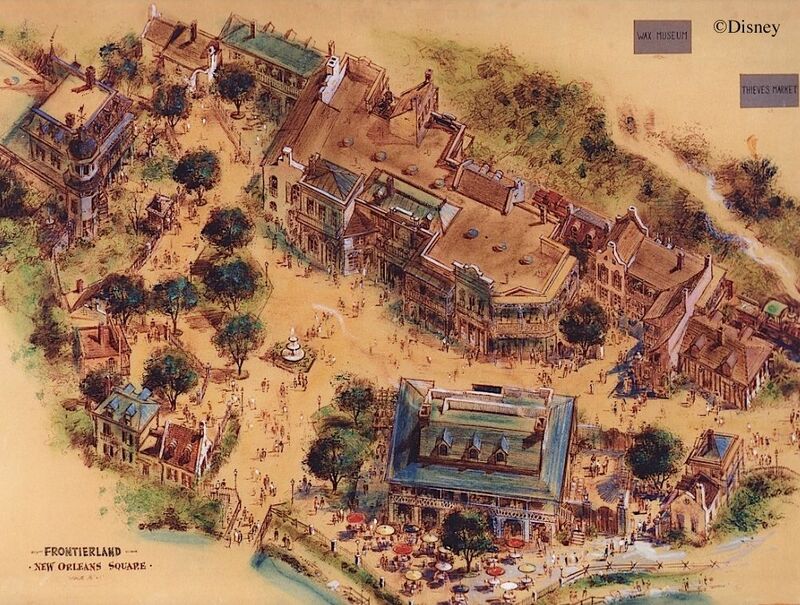 In fact, a dueling oak area was included in 1962 plans for New Orleans Square, which at that time was going to consist of a façade of shopfronts on a HUGE building containing an outdoor setting called the "Blue Bayou Mart," with a "Rogues Gallery" wax-museum and pirate-themed walk-thru below, at basement level. 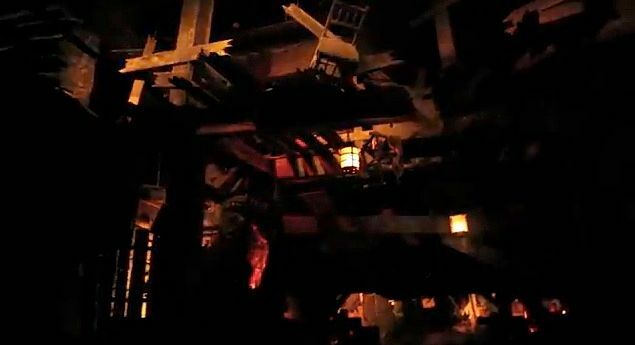 The museum eventually became POTC, of course, and the "Blue Bayou Mart" above it shrunk down to become the Blue Bayou restaurant and tableau at the beginning of POTC. In the original Mart, the "outdoor" area would have accommodated a pleasant, dueling oak area, where you could sit around and enjoy soft drinks. 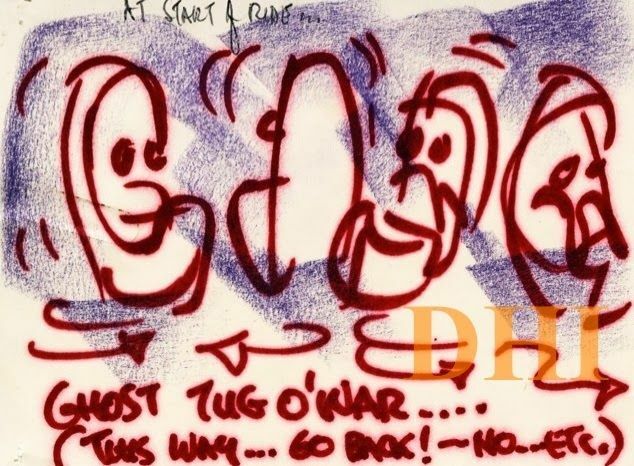 and yet for some reason he included a dueling oak in his sketch of the ride. After so much speculation, finally we have a smoking gun. Let's see. 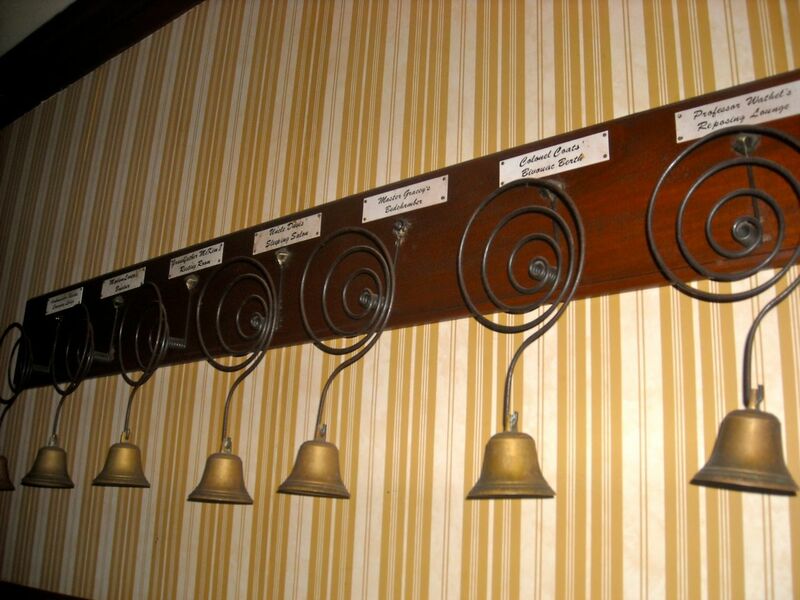 We know that the Mansion has duelists among its characters. Is it possible that originally (or alternately) they were going to be on the bank of a waterway, going through their endless duel beneath a sprawling oak? 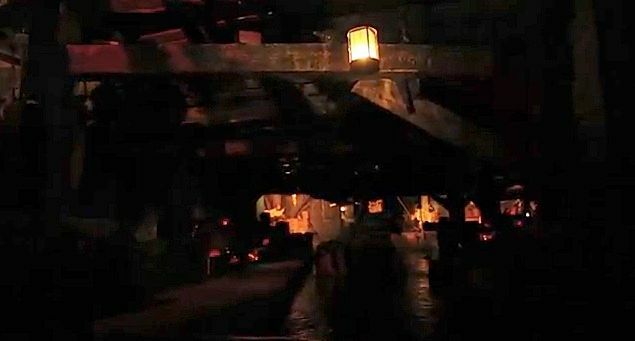 I assume that the Mansion boat ride would have had an outdoor scene or two, much like the midnight jamboree at the end of the actual ride, or like most of POTC for that matter. Unlike the original Blue Bayou Mart concept, McKim has sketched the dueling oak as a graveyard scene, and the pistols on the ground are both still smoking, as if the duel has just barely concluded, but in that case, where are the duelists? 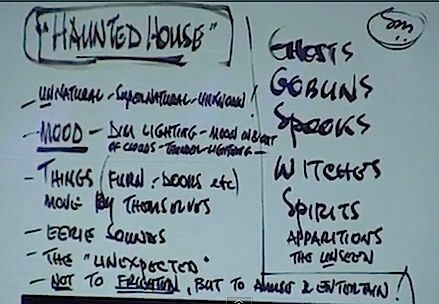 Are we in fact looking at the rudiments of a ghostly gag intended for the waterlogged Mansion? It's a thought. "And now, a vessel approaches, to take you into the boundless realm of the supernatural." What else do we know? 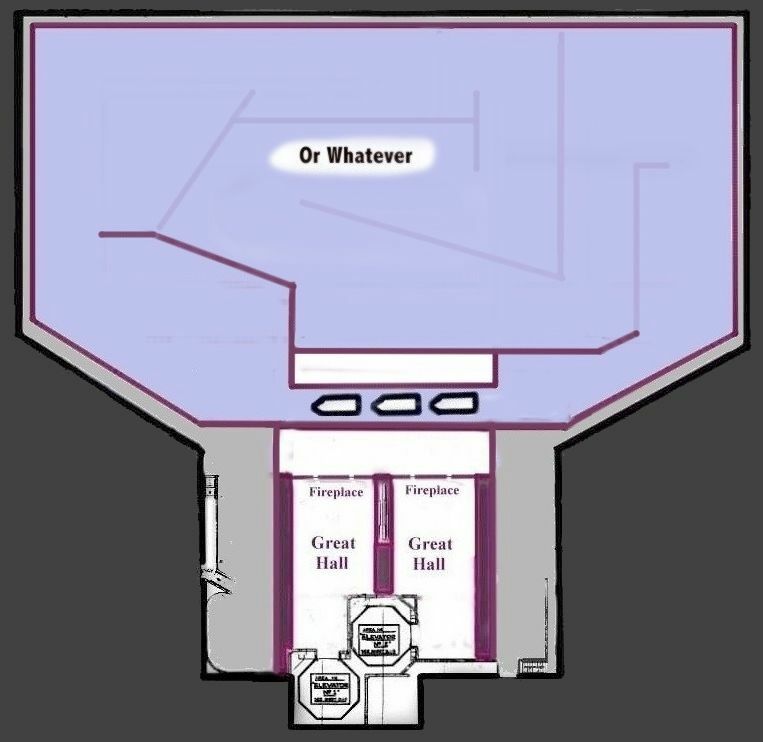 Well, the foyer, stretching galleries, and some version of the "Great Hall" (what is now the changing portrait hall) were scenes already set in concrete (literally) when the boat idea came along. That means you would have boarded the boats in the same place you now board the doombuggies. You will recall that one element of the Great Hall at the time was oversized furniture and artworks, making the guests feel small, as if they had shrunk somehow. The size of this flooded house, therefore, would probably have been greatly exaggerated. 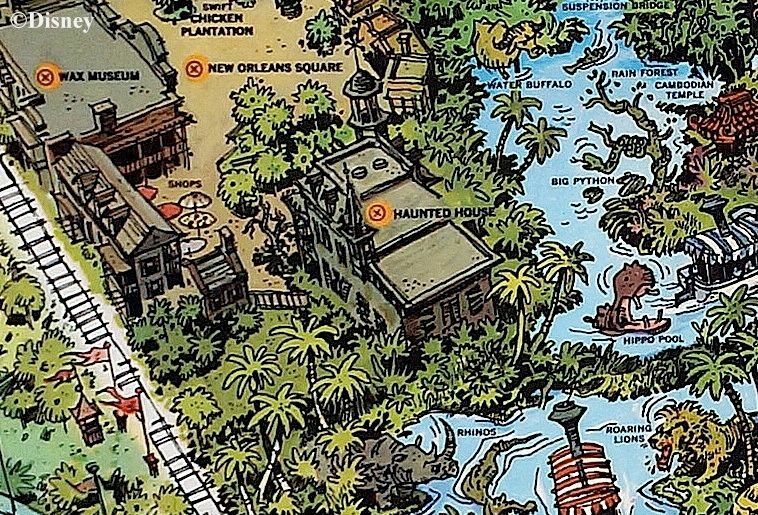 We have zero visual evidence to go by here, so you have to try to re-imagine the Limbo area as a sort of Lafitte's Landing and Blue Bayou made over as a haunted environment. Here's the sort of layout I'm picturing. The two elevators empty into two identical versions of the Great Hall as imagined in 1965. The exits from the Halls would be the false fireplaces at the far end. After that it's pretty much POTC with ghosts. 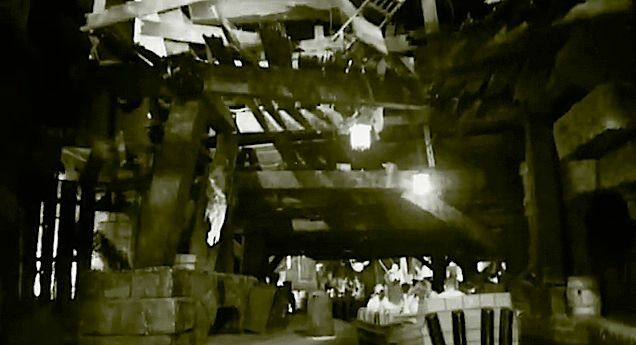 The first time I ever heard of the boat ride concept, I thought it was dumb, because I couldn't imagine how you could get anything resembling a full visit to a haunted house merely by floating around at basement level. 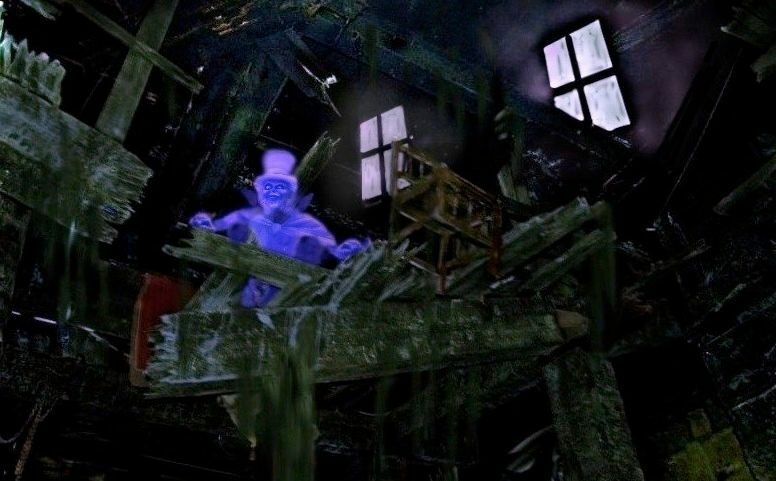 I figured you couldn't pretend to go any higher than that, because it's obvious from standing in line around the building and visiting the foyer and stretching room that the ground floor is not flooded, and this was how things were even when Joerger hatched his idea. But he speaks of "peeling wallpaper," and Pat Burke says McKim's sketches showed "boats floating through the halls." That's not basement level. 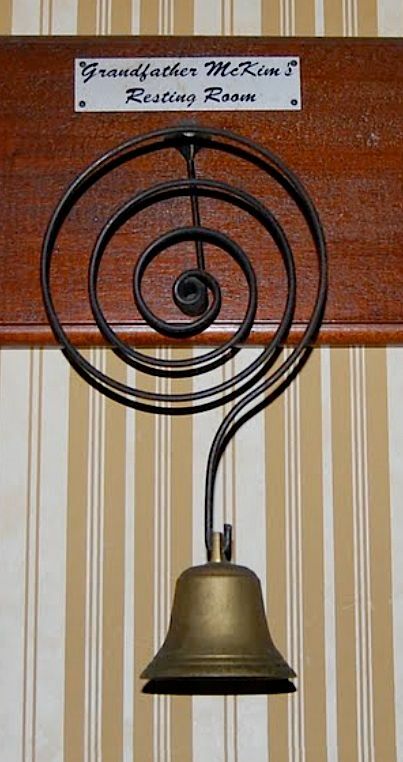 What were they thinking? It's clearer to me now that the idea could have worked. If you don't mind some armchair imagineering, here's one way it could have been done. 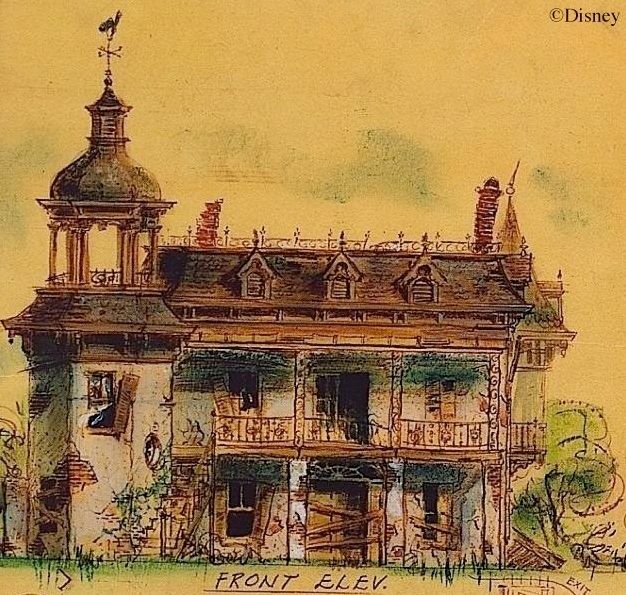 First of all, Walt would have had to relent and let them have the kind of decaying old building he didn't want to see in Disneyland. 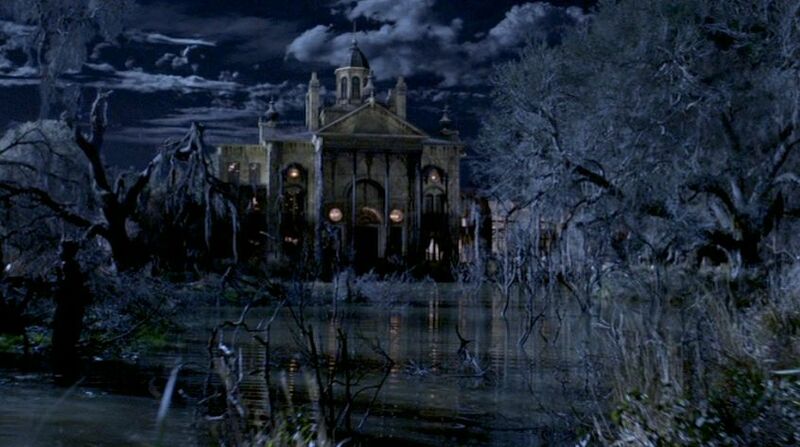 Second, they would have needed to re-landscape around the Mansion, surrounding it with a swamp. That much is obvious. pretty crude and murky, but it ought to give you an idea of what I have in mind. Remember, we're in an oversized environment. like in the movie. No changes in the water level are needed yet. 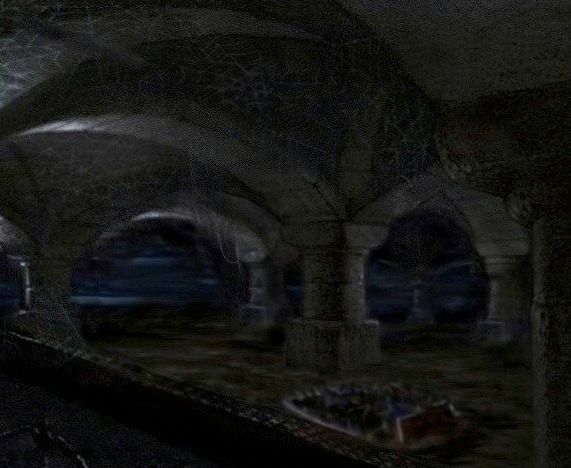 Next, I see us entering a long undercroft, and to our horror we see through the colonnade that a thunderstorm is now raging! The waters are turbulent, and the rain is literally pouring off the roof. As we scoot along, we notice that the ceiling is getting closer and closer (creating the optical illusion of a rising water level). Are we going to be trapped inside by a flash flood? ARE WE ALL GOING TO DIE? Wave goodbye. Get it? Wave goodbye. It's a pun. Drowning is a wave goodbye. Shut up. in we go. Plenty to see both around us and above us (and even beneath us! 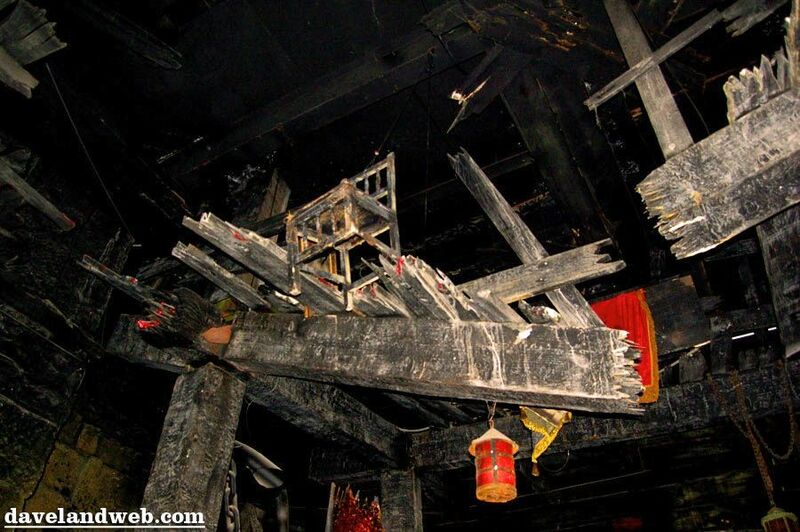 ), since the house is so badly decayed inside its outer shell. There are other possibilities, of course. This is just one way it could have worked. If the flooding were to take place during the ride, and if the internal decay of the building were sufficiently advanced, methinks you could have quite a show. I'm glad they didn't, but after all this amateur imagineering, I've come to the point where I could almost wish they had built it this way. See? I told you we didn't need to show you no steeenking evidence. have been the beginning and the end of the idea. We may never know for sure. 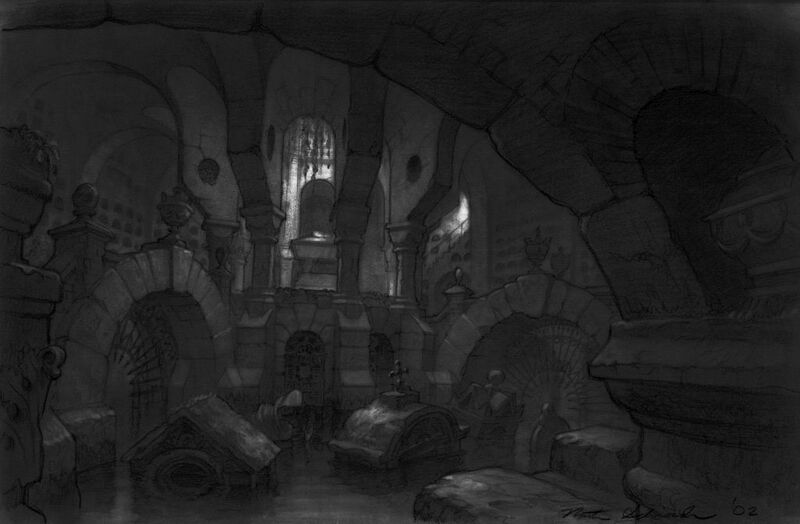 BONUS: here's the Ken Anderson concept painting that I 'shopped into the Nathan Schroeder sketch of a submerged crypt. Until next time, bone voyage.